Kāwhia lay within the boundaries of the King Country. Its people resisted selling land to Europeans from 1863 until the early 1880s, when a small area on the harbour was offered to the government for sale. In 1883 the Māori king's supporters objected to the sale. 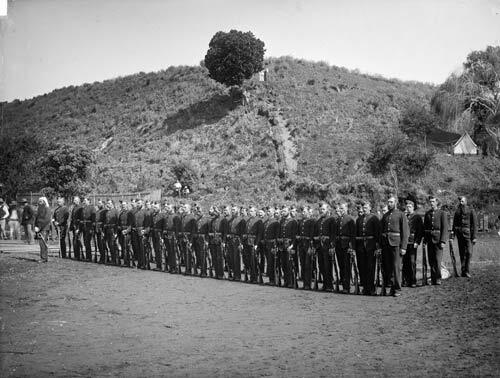 Soon afterwards more than 100 members of the Constabulary Force landed at Kāwhia to set up a redoubt (fortified camp). This photo, taken the following year, shows the men on parade.